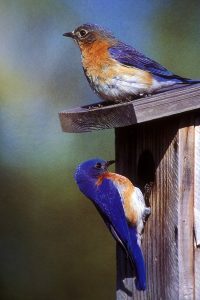 Bluebirds in a backyard nesting box. You want to take part in a citizen science project, but you can’t get away to spend time in the field. What do you do? Count the birds that are coming to your feeder and in your backyard all day long. That may sound random. Yet, Cliff Shackelford, Texas Parks and Wildlife non-game ornithologist, says the Great Backyard Bird Count, organized by the Cornell Lab of Ornithology, is far from random. They combine data submitted by citizens with other surveys, which helps scientists understand how environmental changes affect bird species. And what’s really neat is after thousands of people do it, and in the country tens of thousands people, you see: Wow, look at where black capped chickadees are versus Carolina chickadees. And you can see where the invasion of – say – red breasted nuthatches are that winter. The event is February 15 through 18; it’s easy to participate. Just choose a day and register your location on birdcount.org or eBird.org. So, you just count the birds and submit online. It’s really easy and doesn’t cost anything. Count for at LEAST fifteen minutes and keep track of the species you see and how long you watched. And, you might have chores throughout the day, but you’re constantly walking by the window. Just look and see what’s out there, and it doesn’t necessarily have to be at your bird feeder; it’ can be at your birdbath; it can be in the trees in the backyard. We’ll have tips on making birds count…tomorrow. This entry was posted on Tuesday, February 5th, 2019 at 12:00 am	and is filed under Birding, Events. You can follow any responses to this entry through the RSS 2.0 feed. You can skip to the end and leave a response. Pinging is currently not allowed.